The road to tiny Bukumirsko Jezero (Lake) high in the Kučka Krajina mountains, runs north from Podgorica for some 40km, passing the small villages of Ubli and Kržanja. The road on April 29th is blocked by a lens of lumpy snow on a north facing section about five kilometres from the lake; so I never make it and instead walk the hills round about. The drive up is on increasingly narrow roads, passing through low hills of manna ash (Fraxinus ornus), heavy with white panicles, and spring green hornbeam (Carpinus betulus) that gives way to oak-hornbeam woods full of cream-coloured Roman orchids (Dactylorhiza romana), occasional pheasant’s eye narcissus (Narcissus poeticus). A scarce swallowtail (Iphiclides podalirius) works the roadside flowers but butterflies are soon absent as the road climbs. 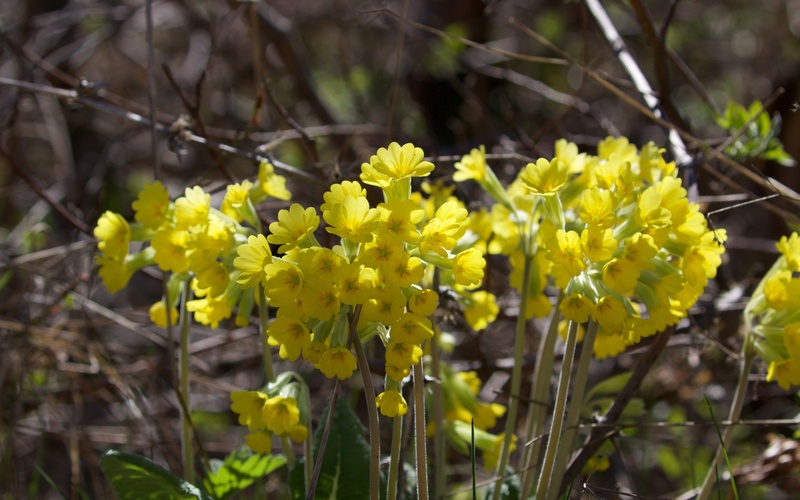 Higher up and beech (Fagus sylvatica) is dominant with a ground flora of cowslips (Primula veris), white wood anemone (Anenome nemerosa) and pretty mauve hepatica (Hepatica nobilis). 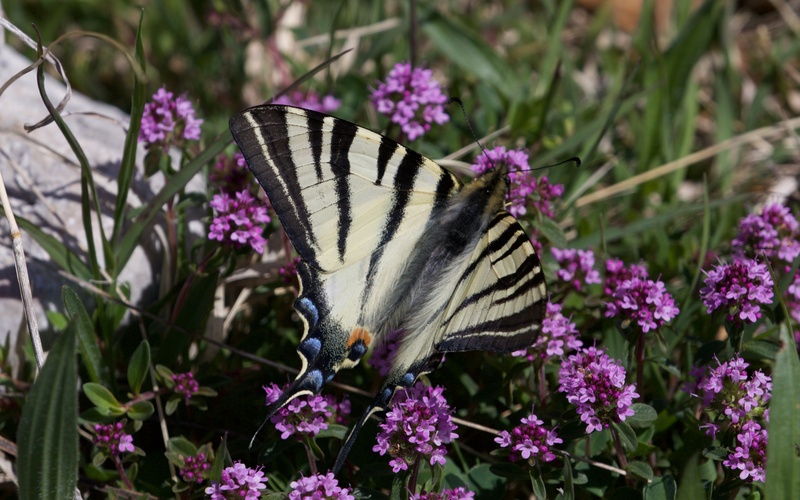 Cowslips and scarce swallowtail on thyme. The bare woodland gives way to an endless swathe of ugly, fire-dead trees, stark, twisted and snapped; uncomfortable and distant echoes of Dulce et Decorum est. The road passes an empty village and small church with fields full of green-winged orchids (Orchis morio). Morio is not derived from mori but moros meaning a fool, because of the green-striped petals like jester’s tights. The mood is broken as woodland gives way to wide and open hills. Ink dots of grape hyacinth (Muscari armeniacum) fill the grassy, long abandoned terraces. Where the snow stops my ascent, there are small, summer farmhouses or ‘Katuns’ with enclosed fields, barns and outside toilets. None are inhabited now but a few fields have been rotovated. Beyond is bare rock, studded with tall junipers (Juniperus communis) then dark conifers on steeper slopes and, above, bare mountains with the snowy summits often lost in swirling cloud. These are all a part of the range of mountains known as the Kučka Krajina and form a wild, western extension to the much higher and wilder Prokletije mountains. Looking east: Katuns in the lee of some of the Kučka Krajina peaks. 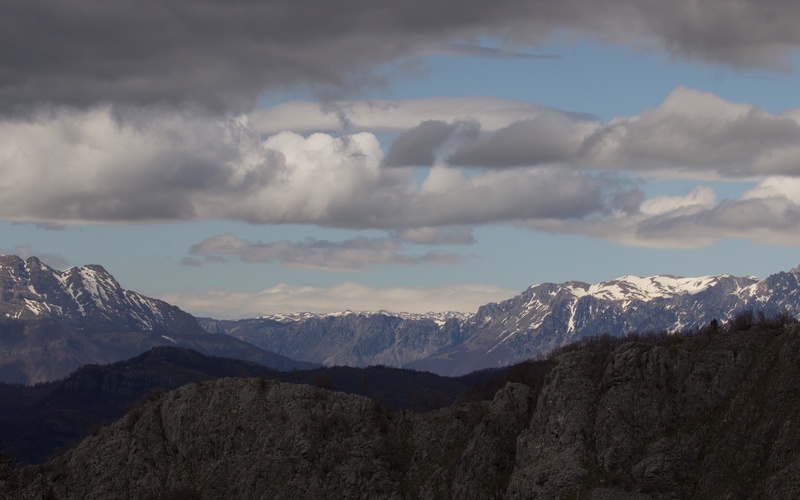 Looking west: over the Morača valley in the middle distance with the Sinjajevina mountains beyond. 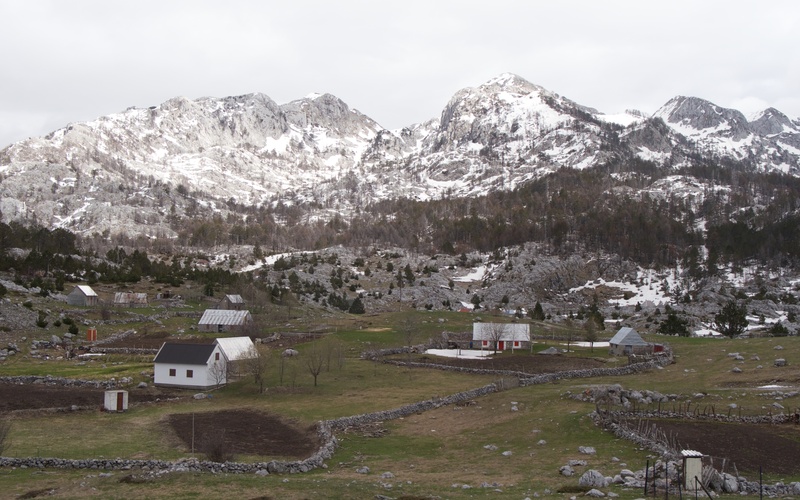 I head west over undulating but easy terrain towards the distant Morača gorge listening to dull brown woodlarks overhead, filling the air with their endless, lilting ‘too-li-loot’ song. A handsome black redstart joins in from a dead pine, plain tinny and scratchy. Mistle thrushes are flushed in pairs, a kestrel gets up off the ground, perches and then away north. I hear a strange but memorable rasping blackbird shout and ring ouzels fly up to tree tops, always at a safe distance, before bolting; there are two pairs, perhaps more. A pair of skylarks undulates through and wheatears flick up on to lookout posts, one Isabelline is passing through and perhaps a European, but it dashes off a rock never to be seen again. 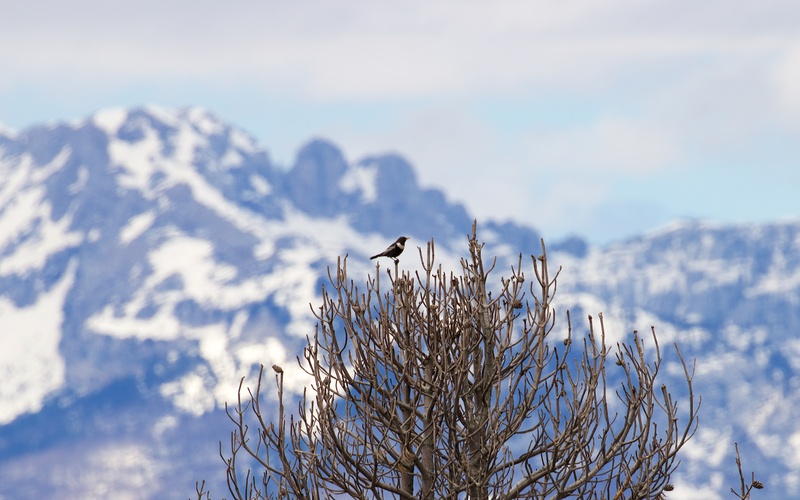 Distant ring ouzel atop a dead pine. A swarm of crocus and hellebore. The ground is covered in patches of dwarf juniper (I think Juniperus communis depressa). 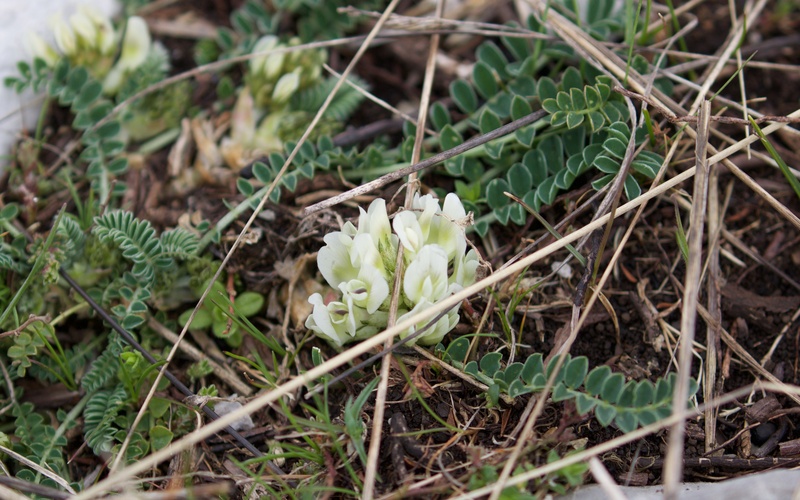 In the wetter depressions, coatings of crocus, mainly small white Crocus vernus albiflorus with occasional standard, mauve C. vernus. 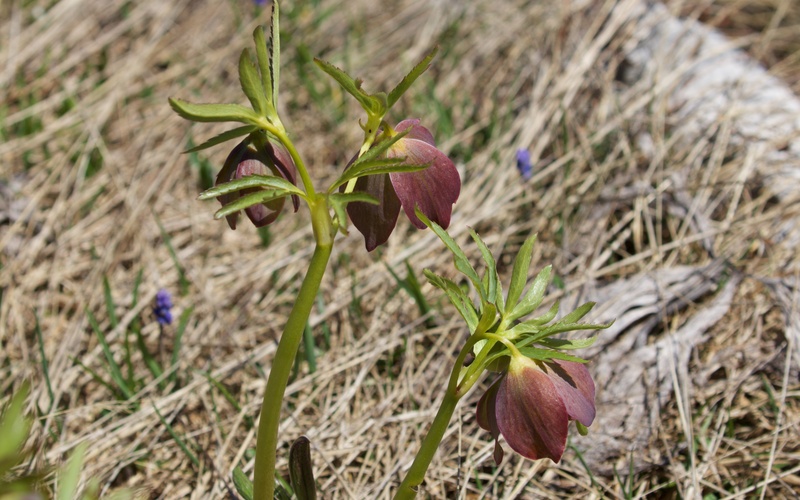 Light green-coloured hellebores (Helleborus odorus) are abundant, many just coming up. Mixed in are hybrids with delicious dark red and chocolate colours and these maybe H. torquatus. 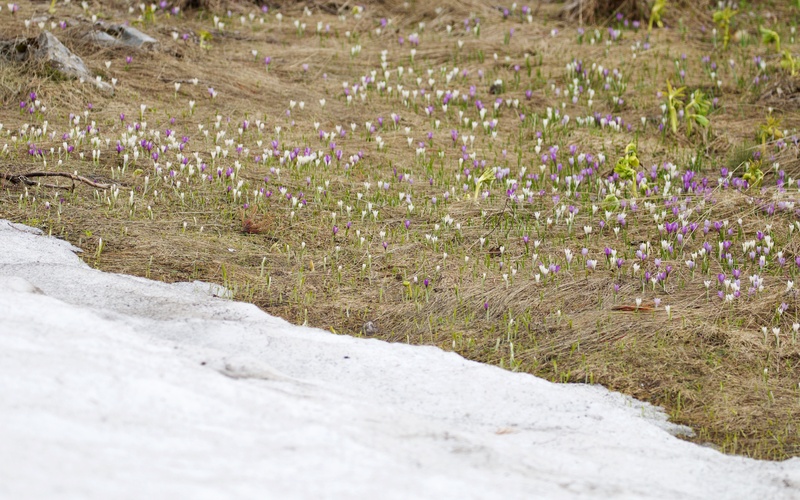 Alpine squill (Scilla bifolia) is also at its peak but never as dominant as the rest. 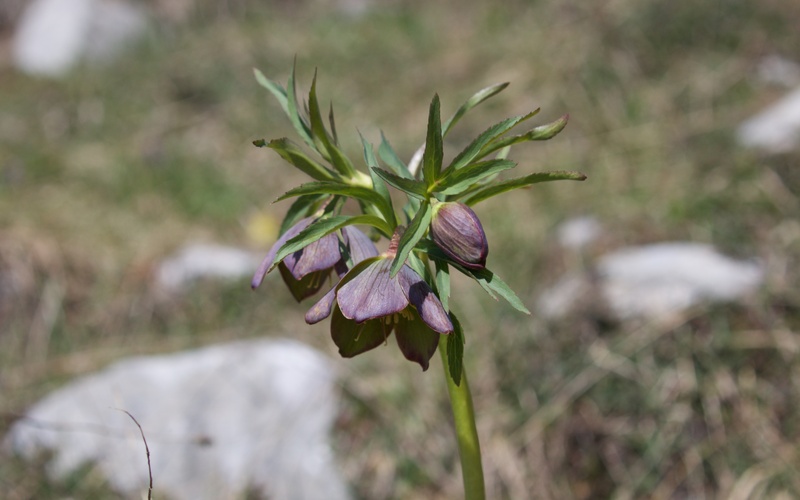 This is a similar plant community to that flourishing around Lake Skadar nearly two months ago. 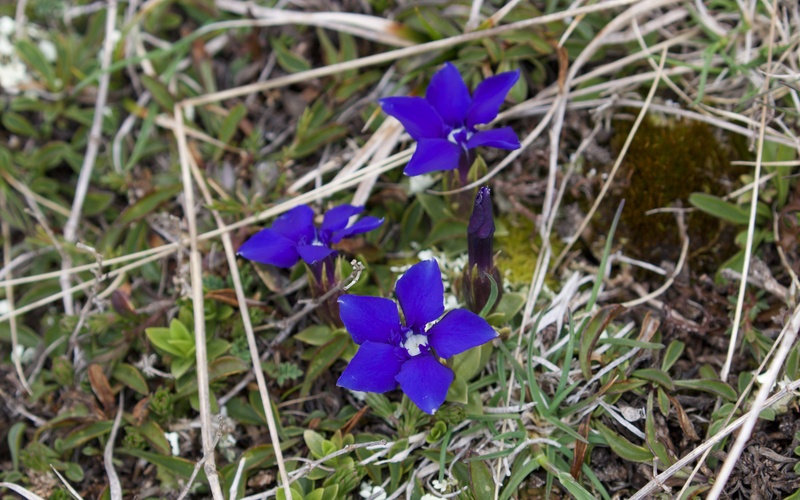 But then, as if to state that this is montane habitat, there are clumps of golden, yellow whitlowgrass (Draba aizoides), and best of all a few, beautiful spring gentians (Gentiana verna) on a barren tump, and alongside an interesting, dwarf legume with trailing leaves that remains unidentified for now. Dark hybrids of Helleborus odorus or possibly H. torquatus. 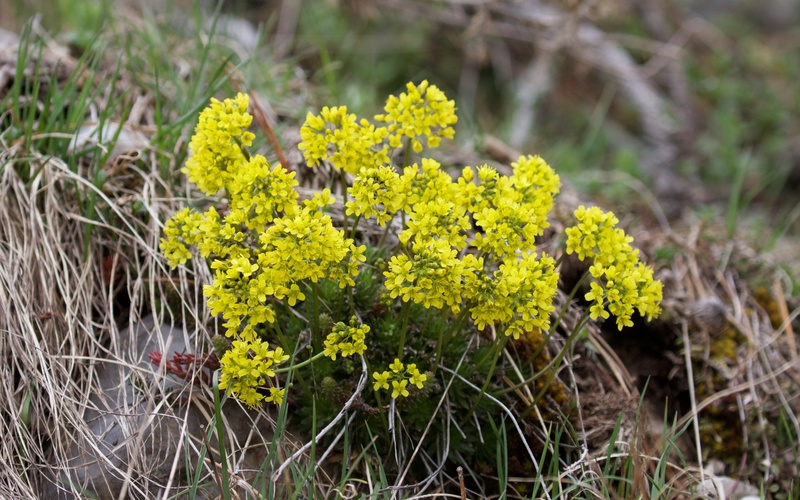 Yellow whitlowgrass and an unidentified, dwarf legume species. From the direction of the deep Morača gorge, a pair of golden eagles circle up, the lower of the two dangling some prey item and, as the other circles above, it slides north and then disappears low over a hill, lost as it glides down into a deep valley behind a wood of dead pines, surely scorched by lightning. I follow to see where the nest is and meander through the dead pine, putting up pairs of chaffinches, and arrive at a viewpoint above a deep U-shaped valley, lined with beech woods and a barren limestone hill opposite. I do not find the eagle nest and wonder whether it is on the cliff below me. Ravens call and otherwise not much stirs; it is worth the hour just admiring the view. Occasional green woodpecker calls resonate from away down the valley and nearby a flustered ring ouzel ticks me off again; these cliffs are likely to contain their nest sites too as well as the kestrel. I only have one further eagle sighting; it is sneaking in to the valley when I am walking out. I walk down to the road and towards the lake for a kilometre or so until a sign advertises a path to the top of Treskavac and then on to Bukumirsko Lake. I turn for home as the clouds roll in and rain spatters. 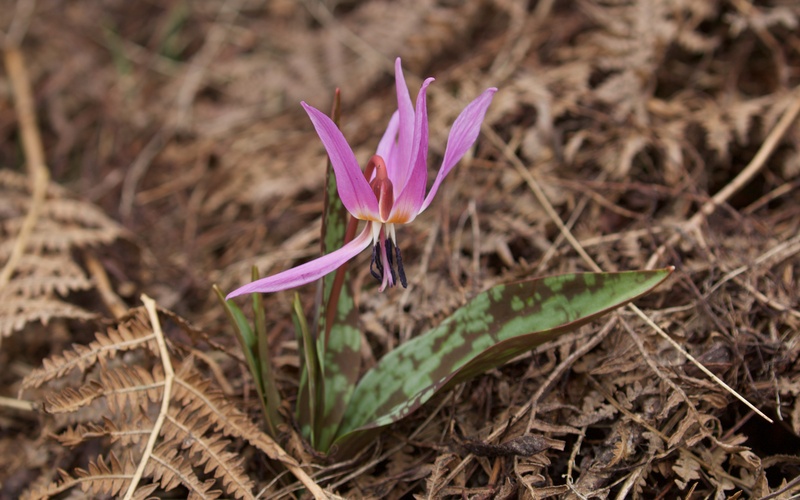 On the bland, dun hillside of pine needles and dead bracken under grey dead pines there is a scattering of spandex pink, dog’s tooth violets (Erythronium dens-canis). 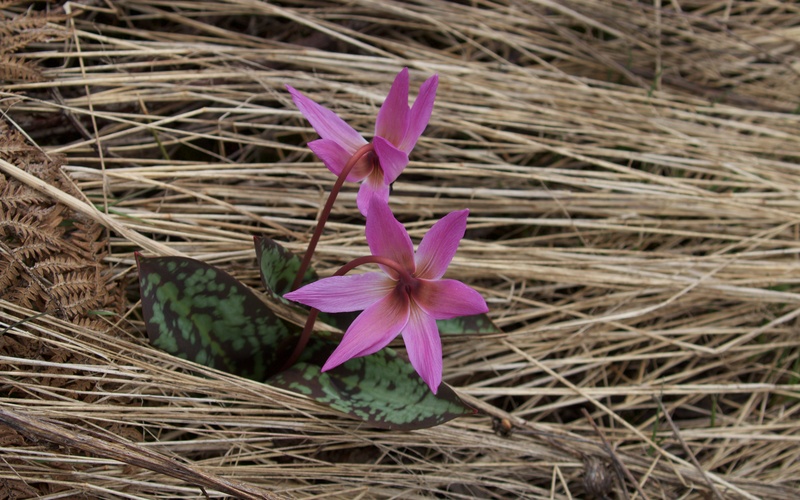 The ones around Lake Skadar, out in early March, were lily white; these are a wonderful, outrageous, contrast and I wonder how I missed them. I walk back up the hill past a busy, tapping great spotted woodpecker and then a pair of rock buntings, giving their thin, seeping calls; they eye me nervously, hoping that I will not discover their nest site in a rock crevice within the roadside cutting.